Since I’ve been back to school, I’ve witnessed three fire drills and the Field Day event and practices, all in a wheelchair. The fire drills were surprisingly fun. One of my fellow creative writers, Liam, wheeled me out into the quad for two of the three fire drills. During the first fire drill, the two of us were really confused on what to do. We were on the second floor and needed to get down to the football field but didn’t know how. There was an elevator but I was always told that during a real fire or fire drill, you weren’t supposed to use it. Eventually, our Vice Principal Ms. Boyle told us to use it anyways because the fire wasn’t in the main building, it was in the studio theatre. No explanation as to why we had so many fire drills all one after the other. The first Field Day practice was a slow day. 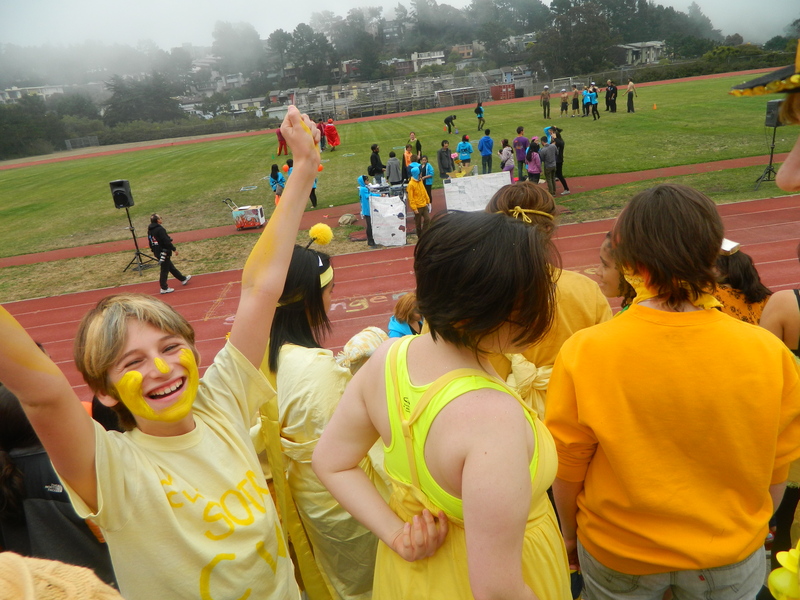 The head of my department, Heather, gave all of the students two options: we could stay inside and paint my wheelchair yellow (our department’s color) or go out to the field to practice for the events that would take place. I of course, had to stay inside to let some of the other students paint my wheelchair. While field day practice #1 was calm, Field Day practice #2 was chaotic. I didn’t even get to actually watch the people on the field practice! My friend and I were too busy figuring out how to get me down to the field safely. That resulted in me freaking out when my friend Nadja tried to push me up a steep, unpaved hill. That was the end of field day practice #2 for me. The actual Field Day was even more chaotic than Field Day practice #2. I came to school wearing all yellow (which is what I thought was enough) until I saw a boy shirtless with his hair and chest dyed red. 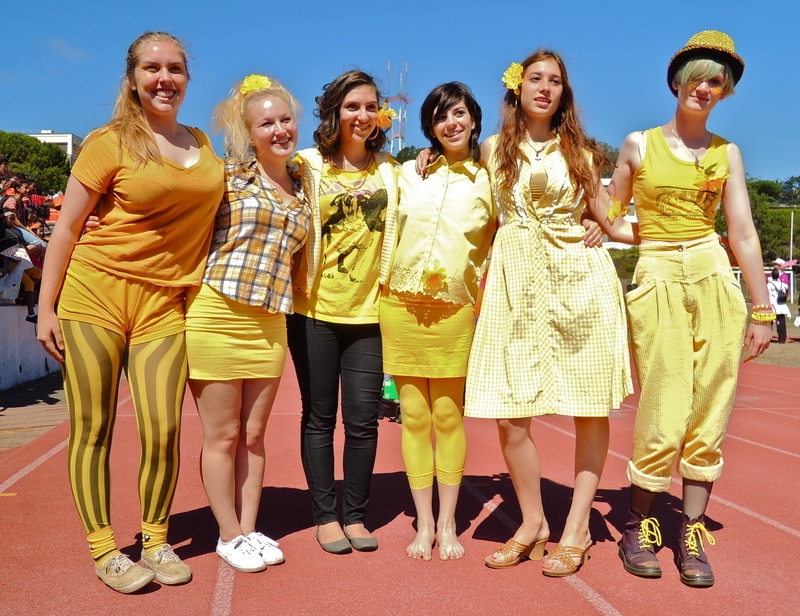 Everyone at school went all out with department spirit that day. The main events were absolutely chaotic. There was a combination of screaming, screeching, and celebrating. Unfortunately, CW did not place in any of the activities but we did try our hardest. You may think that us SOTA kids are artistic recluses. We sit in a school all day with next to no windows and have been known to hiss at the sun like vampires, but you would be surprised how much we interact with the natural world. Sometimes nature comes to us, this week in the form of rainwater falling from the hallway ceiling. But tomorrow, School of the Arts is coming to nature, the field, more specifically, to take part in a legendary event aptly named Field Day. At Field Day, the departments battle it out in a variety of competitions including the human pyramid contest, donut-eating, a three-legged race, and a chain of people trying to fit themselves through a hula hoop. Historically Creative Writing has been a frontrunner in these events, winning the grand prize on two different occasions, and we always take preparations seriously. Thus emerges today’s montage of running and climbing, singing and yelling, all necessary steps to get ready for tomorrow’s games. Good luck, SOTA CW! May the best department win. 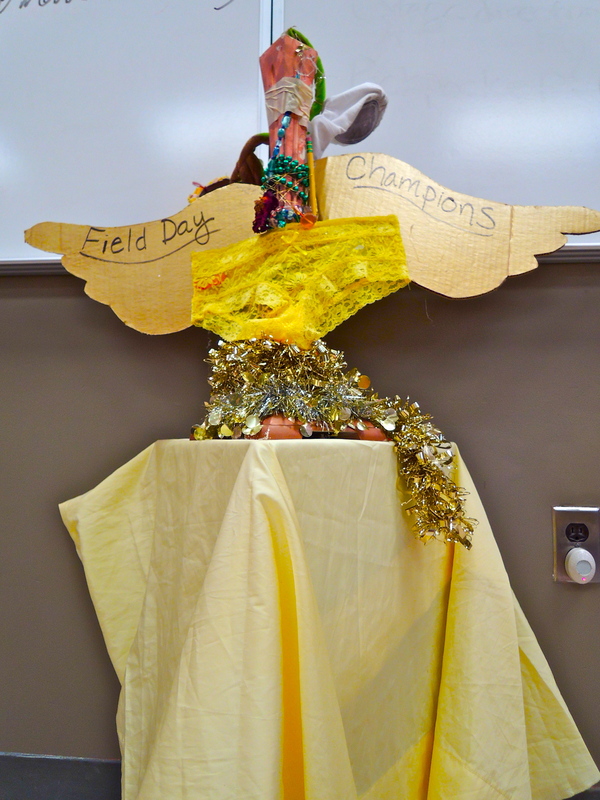 Yesterday was the famed Field Day, a day where the students and teachers of SOTA gather at the field for a rowdy and festive school-wide competition. Everyone was decked out in their departments’ colors and screaming from the bleachers as their representatives fought on the field, gunning for the treasured trophy. We C-dubs (yellow and proud), who took that first place trophy last year, didn’t place this time around, but we managed to still have a blast. 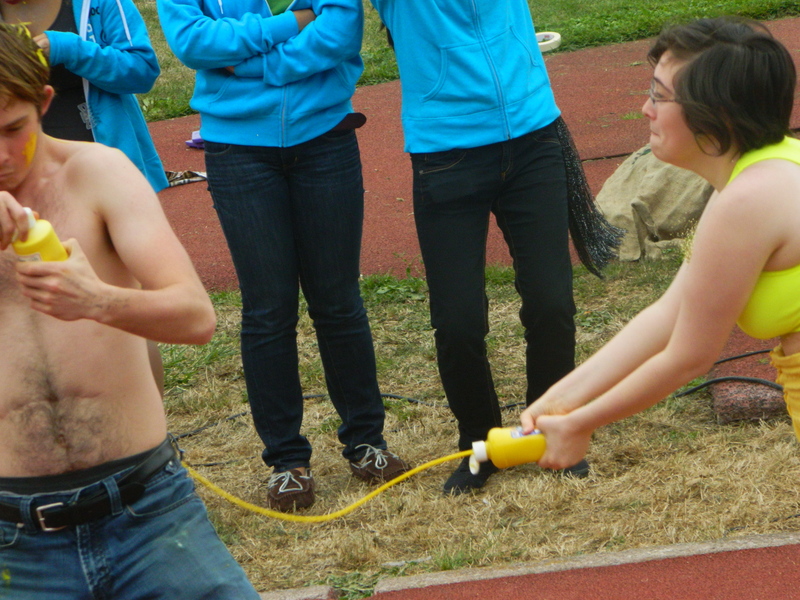 A highlight was the dance competition: our own Aly and Jules surprised us all when they stripped down and whipped out their yellow paint, dousing themselves and the track around them- they had to clean up afterwards, but it was definitely worth it.